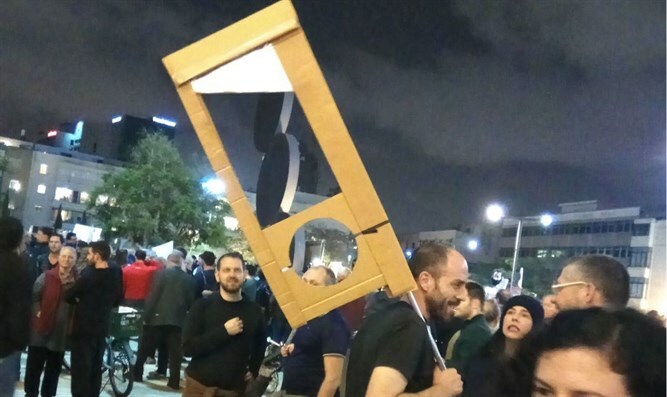 Demonstrator holding mock guillotine at leftist rally Saturday night denies he was calling for Netanyahu's murder. A demonstrator who sparked wide condemnation after carrying a mock guillotine at Saturday night's anti-corruption rally in Tel Aviv denied that he was calling for the murder of Prime Minister Netanyahu. Thousands of Israelis had flooded Tel Aviv's Rothschild Street on Saturday night for the fourth straight week of anti-corruption protests. However, one of the protesters was seen carrying a mock guillotine, causing an uproar, with the Likud saying it was incitement to murder the prime minister. Amit Brin, the protestor photographed with the guillotine, defended himself on Sunday and wrote in an impassioned Facebook post that he was misunderstood. "I am a pacifist and I oppose any kind of violence," wrote Brin. "I have never used violence and have no intention of doing so in the future, and I ask anyone who interpreted what I said or did as a call to violence to stop and not to do so. Whoever understood from my words or actions that I call him or her to be violent was misled." Brin also denied that his actions tarred the protest as a far-left gathering, writing that he did not represent anyone other than himself. "I am not a member of any organization or movement," Brin stressed. "I do not contribute to or register in any party, nor take part in any organized political activity other than independent access to street demonstrations in order to realize the right to protest." "I have nothing to do with the protest leaders, organizers, operators or funders. I never met any of them and we have no connection today." Pictures of the guillotine and of other demonstrators carrying signs supporting the BDS movement sparked wide condemnations across the political spectrum. "The guillotine tonight at Rothschild is incitement to the murder of Prime Minister Netanyahu, [and was there] along with derogatory remarks against Zionism," the Likud said in a statement. "The leftist demonstration on Rothschild Boulevard crossed all the red lines." President Reuven Rivlin also weighed in on Sunday in a press release. While he praised that fact that "Israelis from the right and left people are ready to express their positions," he blasted the guillotine, which he called "clear incitement." "What we saw last night with a guillotine at a demonstration in Tel Aviv is a stain on everyone protesting and on the democratic right to protest," he said. "This is clear incitement, which crosses the boundaries of freedom of speech and protest, and I condemn the clear implications of that act." Police confirmed on Sunday that they had opened an investigation into the presence of the guillotine.